So last week there was a tragedy in Target -- the slushie machine was broken. Cohen talked about this for the entire week so today I decided I wanted to buy him a Halloween shirt to wear tomorrow and he informed me he wanted to see if the slushie machine was fixed. The cute little thing had a rain dance in the entrance of the store when he say it was up and running -- how do you say to no to that? I went in for milk and a slushie and left with milk, a slushie, a smoothie, two shirts for Cohen and this adorbes outfit for Baby Sissy that was on clearance and I had been eyeing for the past month. --Nivea lip care - $2.99. Use $3/2 (RP 10/27). Final Price: $1.49 each when you buy 2. --Market Pantry pasta sauce - $1.00. Use $1/2 Target printable and 20% Cartwheel deal. Final Price: $0.40 each when you buy 2. Not a great list but a few good deals! It's been a long 36 weeks. This mama is pooped. Now that I'm teaching full time AND spending my evenings chasing after a rowdy three year old PLUS carrying around a growing little fetus, I decided I needed some me time. Don't get me wrong, I truly enjoy snuggling with my nugget in the evening after bath enjoying our favorite Nickelodeon shows before bed. But I needed a kid free evening. Not the kind of time where I run on a quick alone trip to Kroger or one lucky evening when I'm trying to watch TV over the sound of a screaming child. I wanted a night with my girls where we could relax, chat, eat some good food and enjoy the company of one another -- without the hustle and bustle of the kiddos (and let's be honest, husbands too). This mama needs a night out with her girls! I had been awake the other night (pregnancy induced insomnia at it's finest of course) and decided to lay on the couch and watch T.V. until my body decided it was time to fall asleep. Of course, as I turn on the television, the first channel that pops up is Nickelodeon. However, it was 10 o'clock and Nick. 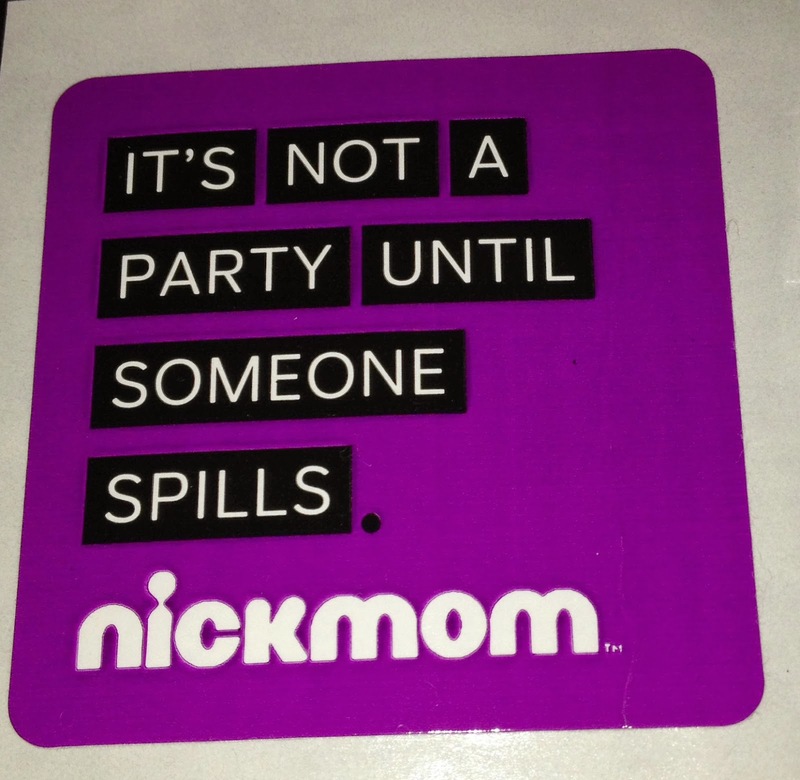 was no longer singing happy Yo Gabba songs about sharing or venturing into wild adventures with Mike the Knight -- it had transformed into a wonderful channel just for moms called NickMom! I was so excited! Now, I'm a huge Tia Mowry-Hardrict fan and had heard she was coming out with a new sitcom called Instant Mom. Apparently my stars had aligned that night because Instant Mom was actually premiering on NickMom right then! How did the show rate? Instant Mom was hilarious! It is the perfect laugh out loud show for moms when the kiddos are in bed. Tia was her usual cute and funny self and the rest of the cast had a great chemistry making Instant Mom even better. 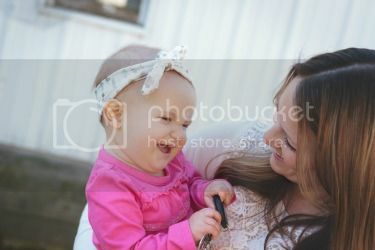 I can totally relate to Tia's character because I'm a step mom myself to a preteen girl and I could compare my experiences to what I saw on the show. I decided that this was the perfect show to share with my girls on our Mom's Night Out - so I set my DVR immediately for Sundays at 10:00 p.m. to record all the new episodes. 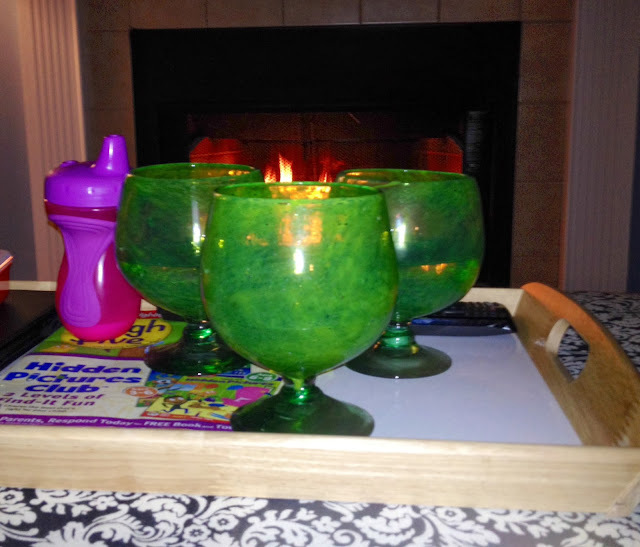 I decided to invite my mama friends over for a night of Cocktails and Mocktails, yummy snacks and a marathon of Instant Mom. Two out of the three of us were second time pregnant mamas while my other friend is a mother of two already herself. I knew this was the kind of night we ALL needed. 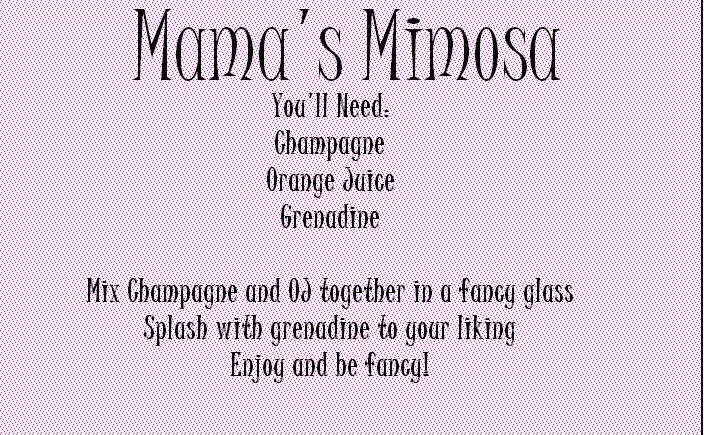 As any good friend would do, I needed to help unwind my un-pregnant friend so I made her one of my favorite drinks we call Mama's Mimosa. 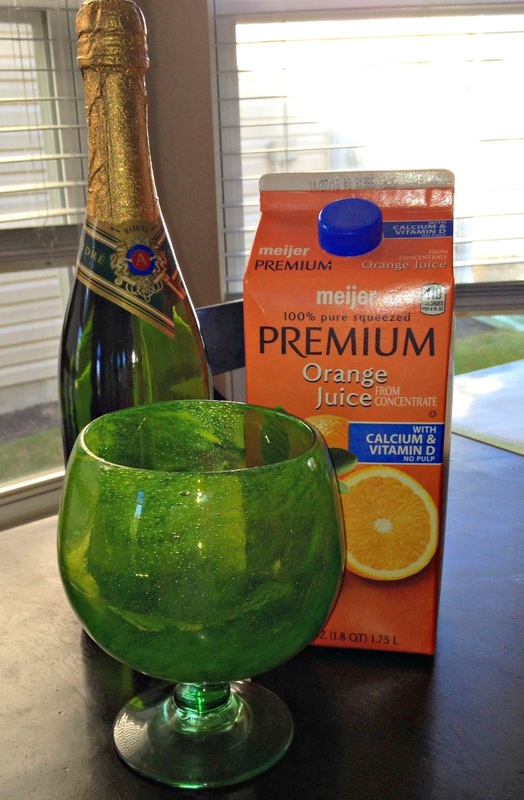 It's a sweet twist on the classic mimosa drink. Obviously my other preggo mama and I drank this sans the champs (which was a total bummer), but we still used the fancy glasses just so we could pretend. 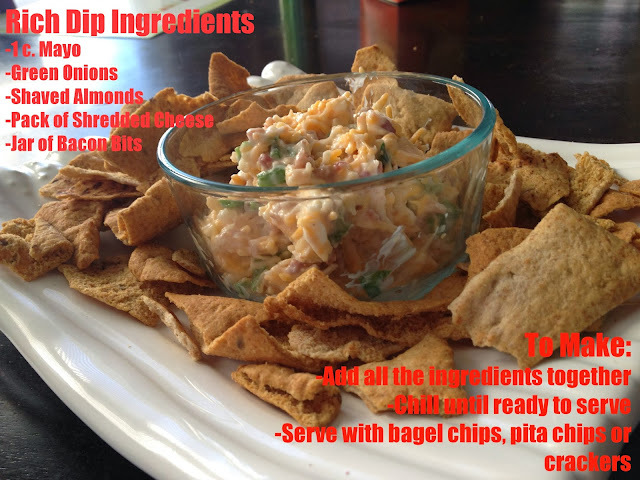 As for snacks I prepared a variety of yummy and high calorie foods that all moms should appreciate once in awhile. As you can see, I may have went overboard a bit but seriously, when you're out with the girls it is totally okay to splurge. My family always makes this dip we cal Rich Dip because it's like dipping your crackers into liquid gold. It's so easy to make too! Once the girls arrived, I got a fire burning in our fireplace and we sat down with our plates full and glasses filled to enjoy our night out together. 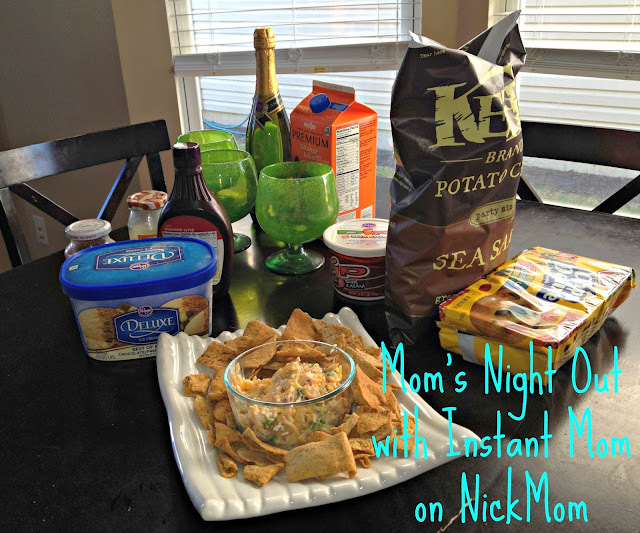 We started our Instant Mom marathon and had a ball laughing together! The show was the perfect addition to the mommies' night together. It was fun to laugh along with the cast as well share our own stories and adventures in motherhood. Pretty soon all three of us will be joining the "2 Kid Club" so it was the perfect night to spend together before our lives become even crazier than before. How fitting that there is a sippy cup in the picture, right? Whether it's a night out with your best girlfriends or a quiet (and very rare) evening alone, Instant Mom on NickMom is your perfect go to show for moms who are ready to relax, laugh and truly enjoy themselves. This Mom's Night Out was past overdue - and it was the perfect combination of laughter and company. Does anyone notice my dog's devil eyes in this picture? I couldn't crop him out because it was just too funny. I promise he's nice and not laser beaming my face off or anything. Due date: November 25th -- 28th. I start my weekly appointments next week which is crazy to think! I've had some serious hip pain and pressure, so I'm interested to see what the doctor will have to say about it. Gender: Girl...still I think we may have narrowed it down to a few names. But she still is nameless as of right now. However her room is coming around nicely and once it's done I'll be sure to post pics! How do I feel? I'm still pretty tired which I'm sure is a combination of working on my feet all day and then tending to an extremely wild three year old at night. Like I mentioned earlier, I'm having crazy hip pain like in my flexor area. I'll be walking and have to completely stop because it feels like a huge Charlie Horse in that area. I never had this with Cohen either. I also have constant pressure and I notice that if I don't sit down, it gets pretty bad. I'm also having some good Braxton Hicks and there have been a few times where I flipped out and started timing the regular contractions. 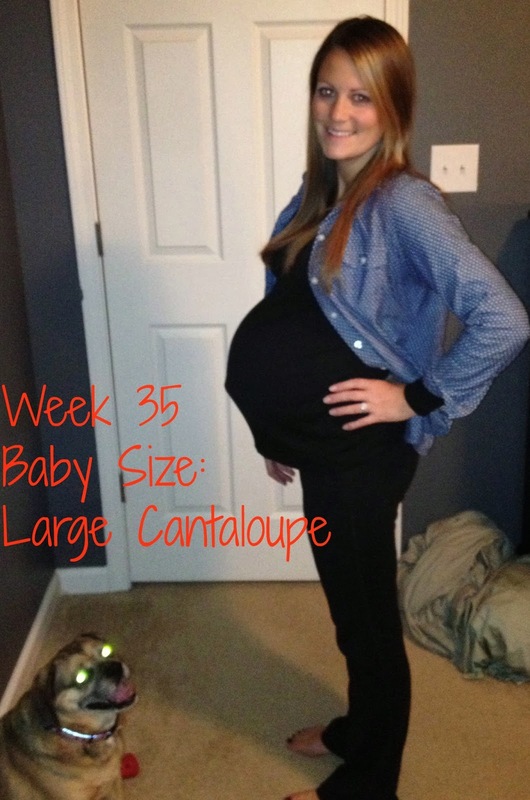 It is crazy how different pregnancies can be from one another! Cravings/Aversions? Aversions - not really. Cravings -- sushi and wine. Actually, I want a really good, strong glass of Champs...mmm. But my meals definitely have to be smaller and more frequent because there isn't a lot of room in there! How do my clothes fit? Oh clothes...did I mention how getting dressed in the morning is my least favorite activity? I refuse to buy anything else new since I am down to about a month -- and that includes a winter coat. Kurtis will just have to share his with me until after the baby's born. Does anyone else agree that maternity clothes are super expensive? Even at Target! Sleep: I find it harder to wind down at night as I stress about all the things that are left to do still. But a good nap on the weekend makes this mama oh so happy! I'm pretty accustomed to not a lot of sleep since Cohen's been born (trust me - the kid doesn't sleep) so I'm just planning on developing a serious K cup addiction in my near future. Movement: Oye this girl is busy. I just looked down a moment ago and my belly was completely lopsided. Her little feet are obsessed with my bladder...and I may have peed my pants once or twice. But she definitely wants me to know she's in there! My Exercise Routine: Umm..this department has been quite neglected lately. I recently started doing my Barre video again and I totally notice a difference in my restless legs at night. I'm trying to be more active but the cold weather puts a damper on the evening walks. Hopefully we'll be able to bundle up soon and take brief walks before the hard winter hits. I'll be sure to post another update soon -- including the room. My sister did an amazing job with the curtains and crib skirt. Thank GOD for a crafty sister!! But in the meantime...I'll just keep waddlin' along. 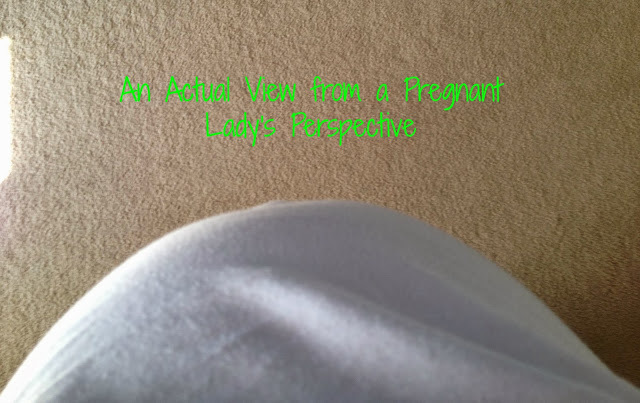 I'm nearing the end of my second pregnancy. This time around has been different because I knew some of the things to expect - good and bad. One thing that I was more prepared for was the social slush of comments that people just spurt out without even thinking about it obviously. My husband and I refer to this as diarrhea of the mouth. Let's be honest - when you're pregnant you're already a mess of hormonal emotions. The last thing a pregnant woman needs is for these thoughtless comments to be expressed -- no matter how thick your skin may be at the moment. 1. Are you sure you aren't having twins? Yes, I have been asked this. And yes, it took all I could do not to knock their front teeth out. I already feel like a whale and being pregnant changes your body in all different ways. Therefore let me make this clear for you - unless I have TOLD you I'm having twins, I'm not so don't even ask me that. 2. Did you get this big with your other pregnancy? Gee, thanks for reminding me that my stomach is so big I can no longer see my feet or breath while I attempt to shave my legs. Some women show quicker and some carry completely small. Either way don't ask me about my size because that number that keeps growing on the scale is quite frightening and comments like that remind me that the number will continue to grow until the baby arrives. 3. 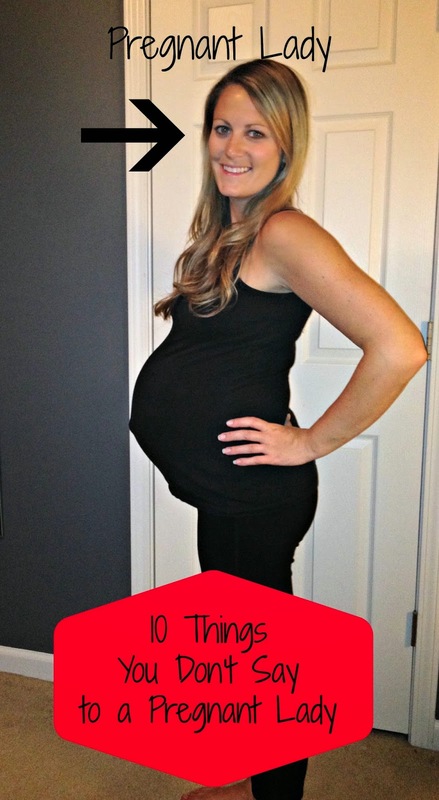 When's your due date? (Insert my answer of around Thanksgiving.) Really? That far away? Now that I have five weeks left, this reminder doesn't really bother me. However, when I was asked this a month or two ago I wanted to scream. Luckily I'm the type of person that just laughs, walks away and then vents about it to my friends later. But you may run into a pregnant woman on a not-so-good day and end up with a black eye after that comment. 4. Are you sure you're going to make it to your due date? Once again, this one doesn't really bother me too much, however I still have a list of never ending things to do (including deciding on a name) before Baby Sissy arrives. Therefore in theory, this comment is okay but it really puts a strain on my anxiety and stress level. 5. Wow, you're really swollen. This comment was from my mother when I wasn't even 30 weeks pregnant. Seriously?!?! My wedding ring still fits AND I didn't think I really had the cankles yet. Apparently I was wrong...well according to her at least. 6. Getting the hairy eyeball from the cashier as I purchase wine or beer at the grocery store. 7. Should you be doing that? I mean, you are pregnant. I'm pregnant not incapable. Plus if I honestly thought I shouldn't be running or lifting weights or holding the box, I'd ask for help. But if you're referring to cooking dinner, giving Cohen a bath or doing laundry then yes, you are right. I probably shouldn't be doing that. A. You are pregnant yourself. B. You are a friend or family member. But if you are a friend of a friend or someone I've said five words to in my entire life, you'll probably get the hairy eyeball and an answer like, "Oh just a few pounds." 9. You look so tired. 10. Wow, I bet you're going to have a big baby. And I bet you have a big mouth too My thought process at this time is refraining to talk back, ignoring that comment and continue to pray that my epidural works on BOTH sides this time around. Better yet, I continue to pray for a baby that is smaller than 7.5 lbs and only takes 3 pushes to enter the world. Now I'm going to go out on a limb and say that many of you, pregnant or previously pregnant, have encountered at least one of these ignorant comments, if not more than one. But in the grand scheme of things it's these diarrhea-of-the-mouth kind of people that make you a stronger person as well as a smarter person. Trust me, the second time around your skin is much thicker AND your mouth gets just a bit smarter so those people better watch out and hope they aren't speaking to one of us hormonal second time (or more) mamas. What is the worst comment you've been given during your pregnancy? I've been a slacker these past few days on my posts. I blame pregnancy - because I can use this excuse for the next 5 weeks for sure. 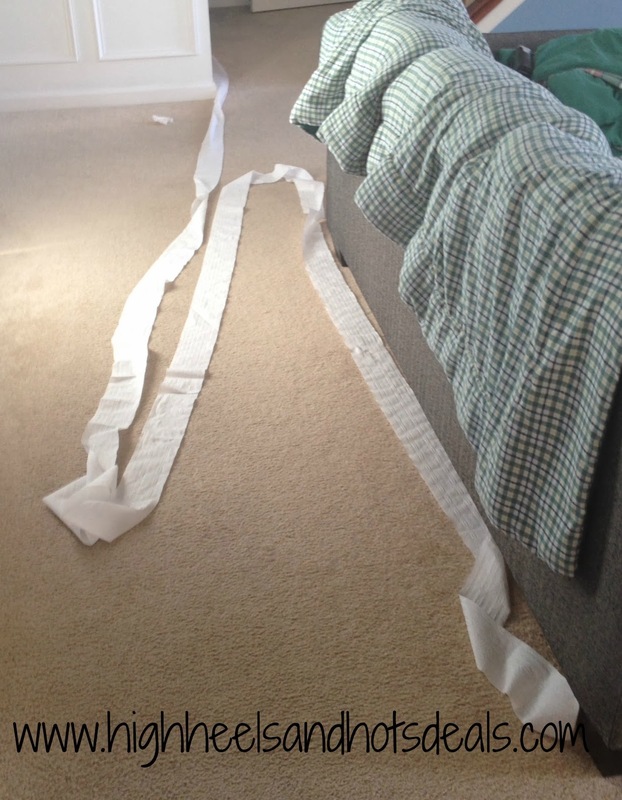 I did run to CVS last night and grab some diapers. In return I got a $4 off a $20 purchase so I'm hoping to be able to grab one more round of diapers before Baby Sissy makes her arrival! --Oral-B Cross Action brushes (2 pk) - $9.99 and get $5 ECB. Use $5 off (Oct PG). Final Price: FREE after ECB. --Crest ProHealth toothpaste - $2.99 and get $2 ECB. Use $0.50/printable or Oct PG. Final Price: $0.49 after ECB. --CVS multipack toothbrushes - Buy 1 and get $2 ECB. --Pantene shampoo or conditioner - 2/$7. Use Buy 1 Get 1 Free (SS 9/15). Final Price: $1.75 each when you buy 2. --Huggies, Pull-Ups or GoodNites big packs - $19.99. 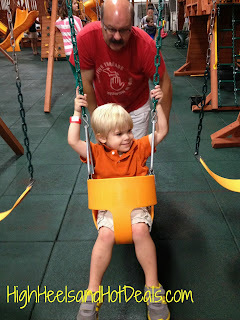 Use $1.50/Snug and Dry printable or $2/Lil Movers printable or $2/GoodNites printable or $2/Overnights printable or $2/Pull-Ups (pullups.com). Final Price: as low as $17.99. What were your favorite ECB deals this week? Since we have started the potty training game in June, Cohen has been completely day trained when it comes to #1. 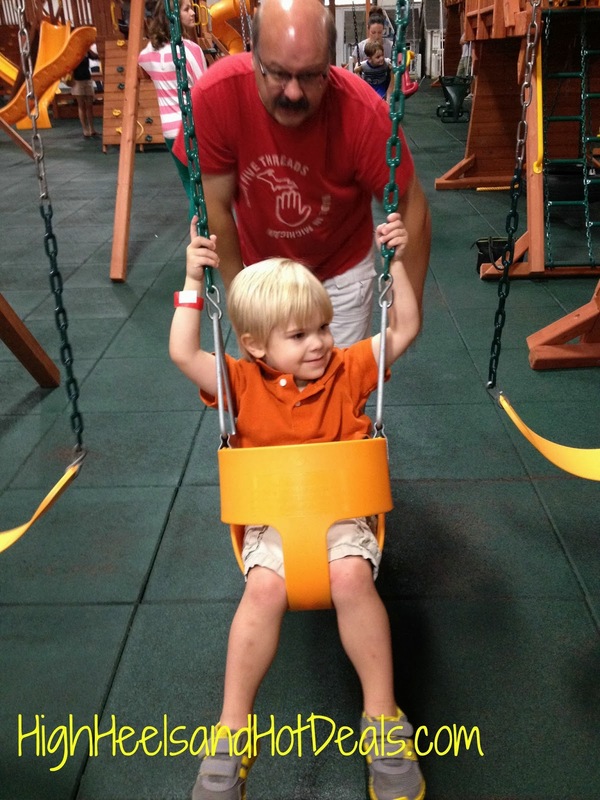 However, the kid refused to poop in the potty -- like he was absolutely terrified to do it. 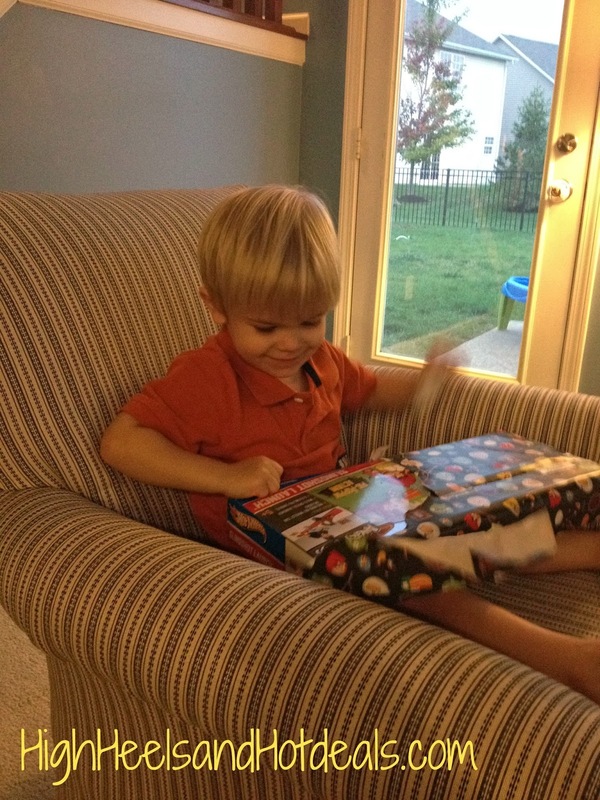 But I kept telling myself, "He's not three yet. When he's three then I'll work harder on this issue." And honestly it wasn't a fight I thought was necessary at the time. But then a few weeks ago, before Cohen's third birthday, he informs me "Mama I have to go poopy." He proceeded to walk to the bathroom, sit on the toilet and do his business like a real man. And ever since he has been doing the majority of his manly duties in the toy-et as he says. Once again it was just a reminder that Cohen will be ready on Cohen's time -- as he's been with every other milestone in his life. So you're asking, what in the world does a fish have to do with this? 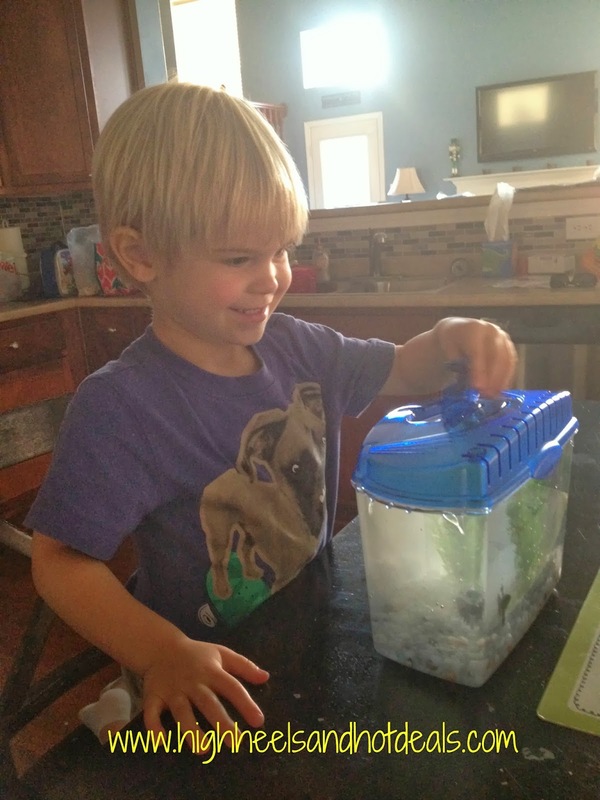 Well, this summer a few of our bribes incentives to get Cohen to attempt to conquer his fear of #2 in the toilet was by telling him we'd get him a fish. The second the kid started using the potty for both of his businesses, he reminded us that it was time to get his fish. Therefore this family made a trip to PetSmart to get Coco's first pet. Meet Shark. Yes Cohen named him. 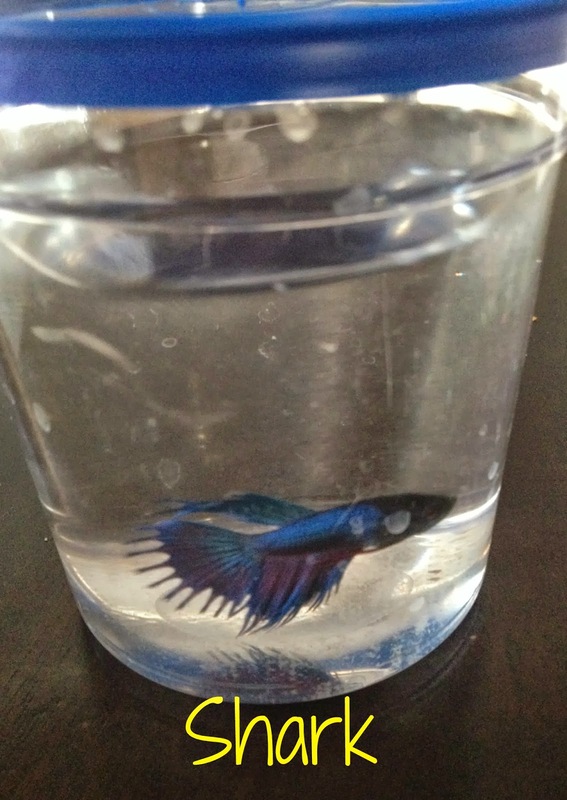 Okay, I'm going to be honest with you, this Beta was seriously depressed the second we brought it home. I may not be able to keep plants alive but I promise you I know my fish. Ask my mother. We had a goldfish that I won in third grade at my school carnival for over 20 years. That is for real yo. And the fish only lived in a bowl. 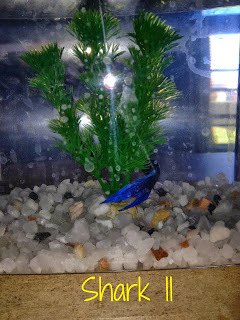 But our buddy Shark wouldn't eat, barely moved and his little tank got really cloudy. 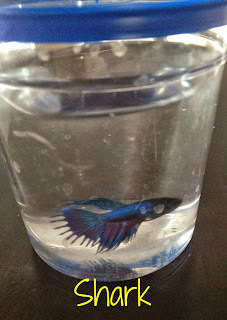 Exactly 1 week after we got Shark, he passed away to the Pearly Gates of Fish Heaven. I was a little unsure as to how to break it to Cohen. I mean he asked about Shark everyday. He loved to feed him, look at him, open up the little door and peek in on his friend. How was he going to handle the death of his beloved first pet? I decided to do what any other mom would do -- just not tell him right away and see if he noticed. "Mama, Shark's dead. Aww man! Can I get a purple one?" Yes, honey. Of course. Especially with a response like that. Crossing my fingers we make a month AND continue to poop in the potty. 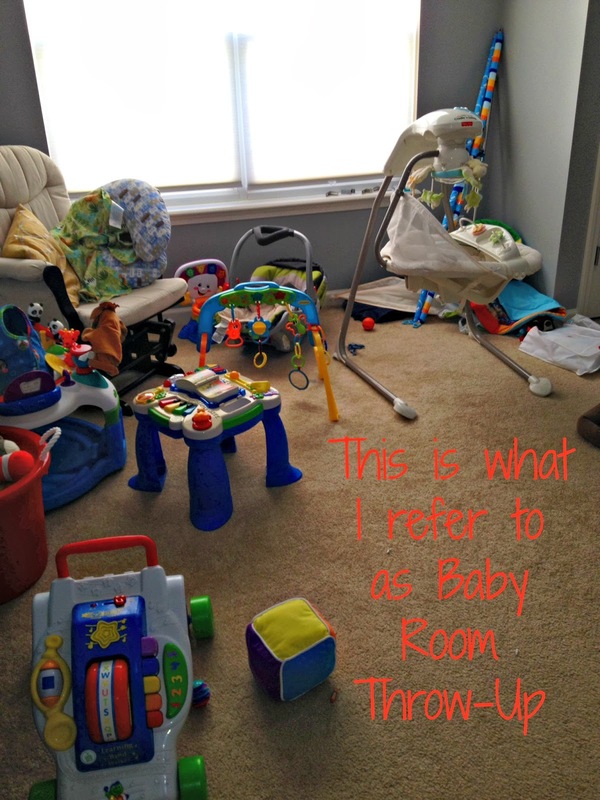 Oh the joys of mommyhood. Last week was a great week for Target deals! This week, however, is a little slower but you can still grab some of last week's freebies this week too! --Advil film coated - $5.99 and get a $5 Target gift card when you buy 2. Use two $2 off (RP 8/25) and 10% Cartwheel deal. Final Price: $0.90 each when you buy 2 after gift card. --Quaker granola bars- 2/$4. Use $1/2 (RP 9/29) and $1/2 Target coupon (target.com) and 5% Cartwheel deal. Final Price: $0.95 each when you buy 2. --Huggies Super Pack - $22.99 plus get a free 3 pack of wipes. 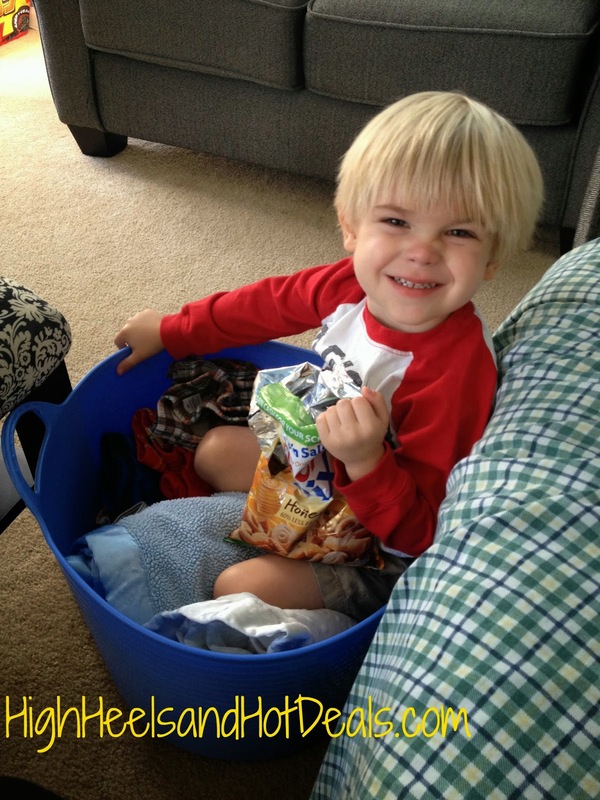 Use $2/Lil Movers printable or $2/Overnights printable or $2/Snugglers or Movers (SS 9/22) or $1.50/any Huggies (SS 9/22). Final Price: as low as $20.99 plus free wipes. I know I'm a day late however I decided to spend my week long Fall Break enjoying it how it should be spent -- not thinking about school. Therefore Sunday rolls around and I have yet to do report cards...however they are done my friends, they are done. --Almay Intense i-Shadow, Liner or Mascara - $5.99 and get $3 ECB. Final Price: $2.99 after ECB. There are a few other ECB deals that you can score, but these I felt were some of the best. What's your favorite deal this week? Oh how I enjoyed my final day of the week that I had off. You know how you have all these things on your To-Do list yet for some reason none of them get accomplished? Yes that was me this week but I totally think it is okay considering the fact that this was my last week I get to spend alone with Cohen before Baby Sissy arrives. I then spent last night going through a box of Kleenex as I as cried a river over Glee. Seriously - one of the best and most emotional episodes of TV I have ever seen. So now I will share with you some deals this week at Kroger. You know we could all use the fuel points considering gas decided to jump $0.40 on Wednesday. Now hurry and clip your Friday Kroger digital coupon for a $0.45 2 liter of Dr. Pepper 10! 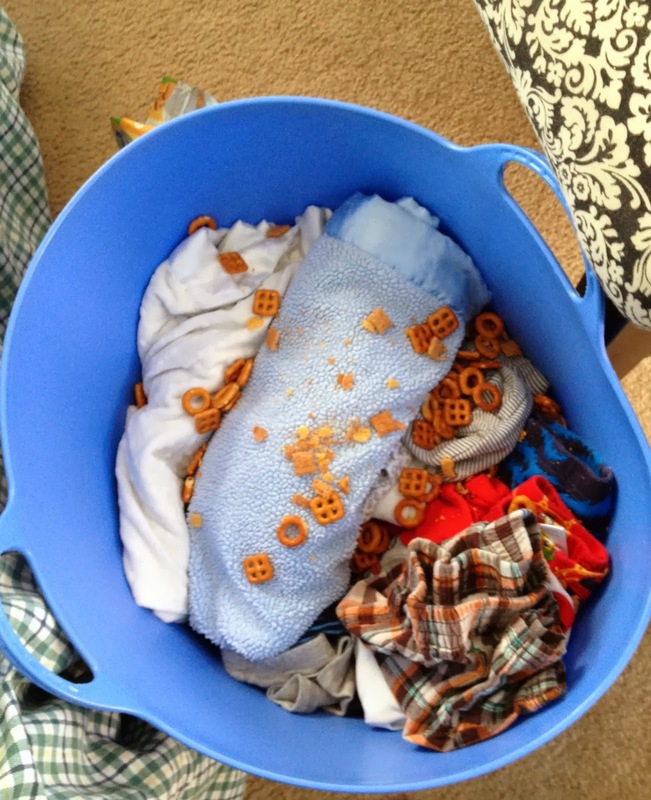 Look at my cute little man enjoying his afternoon snack in my clean laundry basket. Apparently it was a Win-Win situation for all. Cohen got out of cleaning up his mess, Brady got a great afternoon treat and I didn't have to help clean it up either. 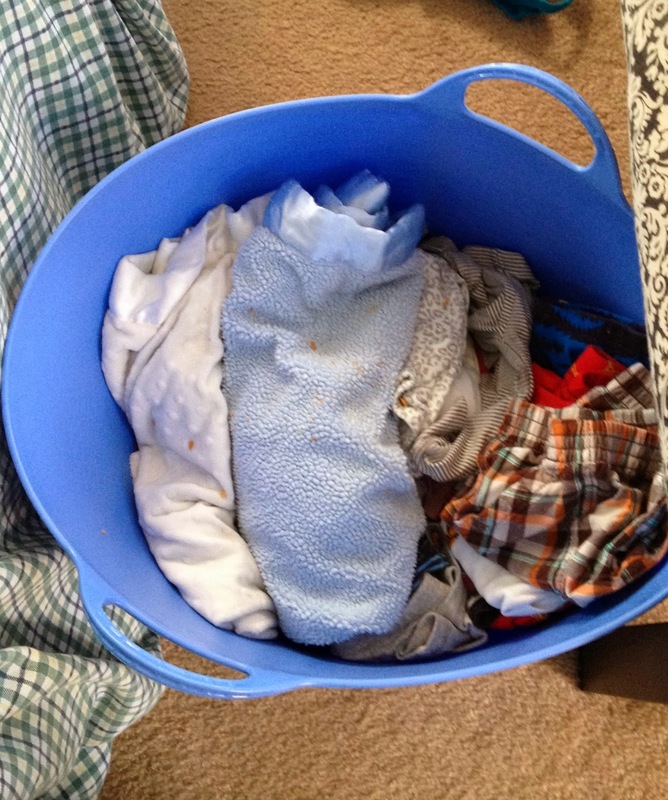 Now the real question is....Do you think the laundry is still clean? Okay so I'm about to work on the Target match ups for this week and HAD to share this deal with you now before I post the entire list. Fisher Price has some HOT coupons right now! 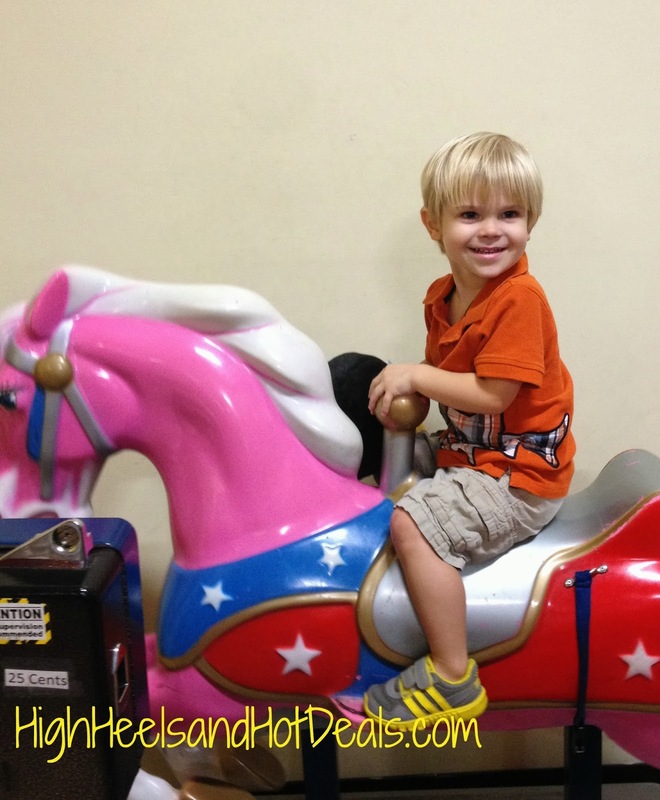 Know any little ones having a birthday or what about the holidays? Never too early to start shopping -- especially with this HOT deal! Play and Learn Puppy or Sis is just $4.18 this week! I will be picking one of these up for Baby Sissy I believe -- or maybe for one of the 2734823 baby girls I know being born in the next few weeks. 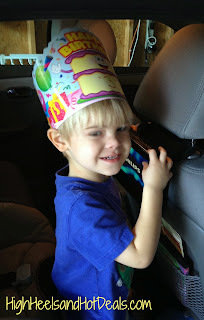 This past Saturday we celebrated our little firecracker's third birthday. Yes. I said THIRD birthday! I am in as much denial about this fact that you are as well. 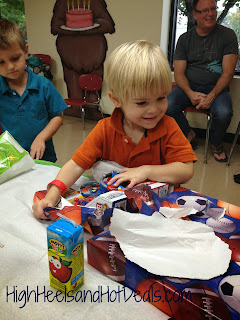 It feels like I was just planning his first birthday and now he's a preschooler! What's Cohen up to now? Well, the kid is all about Angry Birds that's for sure. We had his Angry Bird themed birthday party at this great place called Recreation Unlimited. Basically it's an indoor showroom where they sell models of all these great playsets but the geniuses also host birthday parties. He had a BLAST! 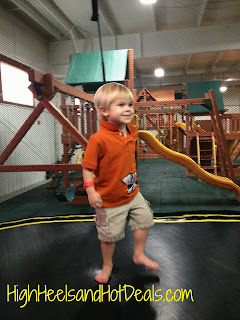 Plus the weather was super rainy and dreary so it turned out to be the perfect day for his party. My husband has the bulk of the pictures but here are a few shots that I got of the birthday boy. Cohen recently woke up one morning and was talking in full sentences. The things he says cracks me up. For example on our way home from our 3 year wellness check at the doctor today he says, "Mom your car is faster than dad's." 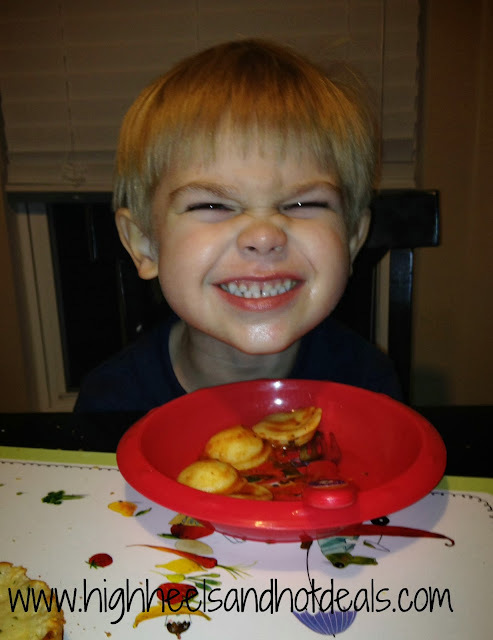 His class at school has also been talking about Halloween and his new favorite thing is to ring the doorbell, open the door and yell "Trick or Treat!" But the best part is most of the time when he opens the door it's just the poor dog standing there so every time he hears Cohen yell "treat" he gets all excited. I also love when he wakes up in the morning or from nap and he'll say in his sweet little voice, "Good morning!" The things he knows amaze me . He knows all his colors and can count up to fifteen. Ask the kid to name any kind of truck and he can tell you the exact name. We have a subdivision being built by us and he pointed one day and says, "Hey look! A skid steer!" He totally made the connection from his Trucks book that he reads almost every night with dad. But I'm just astonished by how his little mind is turning and the things he picks up, learns and is able to apply. Unfortunately this is not always necessary - like the time we were walking into Target and he points at the man with the eye patch and yells, "Mom! A pirate! Arggg!" Great connection - terrible timing. I'm bracing myself for the year of the threes. I hear they can be more terrible than the twos but with the addition of Baby Sissy in a few weeks, I hope they are still manageable. 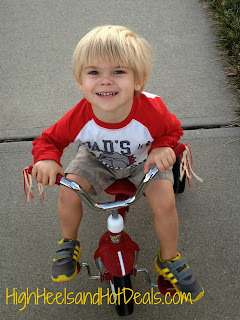 But I really love watching this little monkey grow into a little man. Even though I'm tired, he knows how to wear my patience thin and is the master at testing the limits, I truly love the little guy and I wouldn't change the person he's growing up to be for anything. What was your favorite age of your children?